We are fortunate to have our teacher Khenpo Samdup Rinpoche offer these teachings and participate in the discussion when available. When Khenpo is unable to attend a senior student will facilitate and lead the discussions. 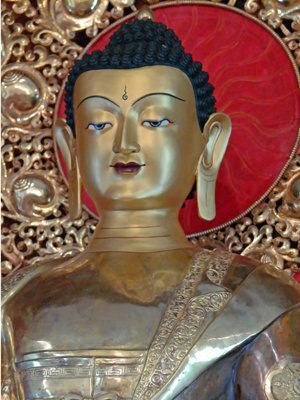 Refuge To take refuge in the Buddha, Dharma and Sangha, the basis of Buddhism. Four Noble Truths contain the essence of the Buddha’s teachings. It was these four principles that the Buddha came to understand during his meditation under the Bodhi tree. Four thoughts that turn the mind. 1) Precious Human Life 2) Death and Impermanence 3) Karma (Cause and Effect) 4) Suffering (Unsatisfactory Nature of Samsara). The Two Truths. This doctrine tells us that existence can be understood as both ultimate and conventional (or, absolute and relative). Conventional truth is how we usually see the world, a place full of diverse and distinctive things and beings. Ultimate truth is that there are no distinctive things or beings. To say there are no distinctive things or beings is not to say that nothing exists; it is saying that there are no distinctions. Six Paramitas. The six perfections (paramitas) are: generosity, ethics, patience, enthusiastic perseverance, concentration and wisdom. For each perfection we will be looking at its meaning, the method of following it, its divisions and what should be done in the practice of that perfection. Karma Cause and Effect. The fundamental law of karma, cause and effect, is that the result of a virtuous deed is always happiness, and the result of a non-virtuous deed is always suffering. Bodhichitta. In Sanskrit, bodhi means “awakened” and chitta means “mind” or “heart.” Bodhichitta — “awakened heart-mind” — is the compassionate wish to realize enlightenment for all beings, not just oneself. Through Bodhichitta, the desire to attain enlightenment transcends the narrow interests of the individual self. Three Roots and the Dharma Protectors. The three roots are the Guru, Yidam and Dakini. The Guru is the root of blessings, the Yidam of accomplishment, and the Dakini of activity. A Dharma Protector is an emanation of a Buddha or a Bodhisattva whose main functions are to avert the inner and outer obstacles that prevent practitioners from gaining spiritual realizations, and to arrange all the necessary conditions for their practice. Seven Branches which involves seven different ways of accumulating merit, each of which serves a specific purpose. The offerings are: prostration, offering, confession, rejoicing, requesting the turning of the wheel of the dharma, asking Buddha not to pass into parinirvana, and dedication of merit. Three Vehicles. The three vehicles or paths of Buddhism which are: Hinayana, Mahayana and Vajrayana. Vajrayana Empowerments. This is the process by which a lama with experience in the particular practice confers on others the description, explanation, visualization and order of the practice, along with appropriate offerings and specific mantras. Six Bardo. In Tibetan Buddhism, a bardo is an in-between state. The word is often used to mean a state between death and rebirth. Each week the beginning concept class consists of a teaching one of the above topics along with open discussion time for questions and answers. It is important to have a solid foundation to fully understand the continuing path of Buddhism and this is the perfect, open atmosphere in which to begin. Shamatha, or Calm Abiding, meditation helps to free the mind from disturbing emotions and conceptual thinking processes. It brings the mind under control, under discipline, with some degree of single pointed focus, with full alertness of mind. By doing this meditation, the individual is able to suppress disturbing emotions and gain inner peace, harmony and balance. The basics of how to practice are discussed each week. The study of concepts and the practice of meditation are core components of the Buddhist path. Combining the two greatly facilitates the practitioner’s progress.